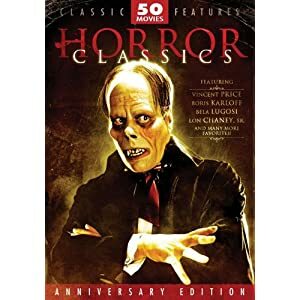 Imagine having 50 very old horror movies in just one box. 12 DVDs, priced at about $1 per DVD! That's a lot of hours of entertainment for a very low price. This is a good gift for horror fans or if you want to give something fun for Halloween. There are some reviews that say the picture and sound quality on these discs is not very good. If you want higher quality video and sound, you might want to skip this one. A lot of genres are included in this product. Some include strange and terrifying creatures while others feature madmen and serial killers. A list of titles is on the merchant's website.